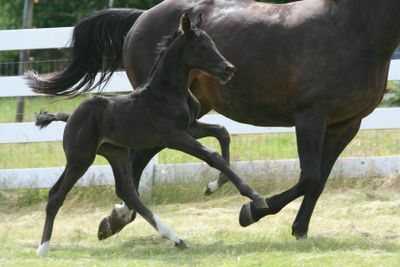 On June 16, Quailhurst mare Mon Reve (“Maile”) gave birth to a stunning black colt, Elliott, by the KWPN stallion Olympic Ferro. Since his arrival, Elliott has delighted us with his inquisitive and outgoing nature. He is exceptionally correct in his conformation and has shown off his stunning movement from his first romp around the stall to many playful mornings in the pasture with his mom. Elliot is also special in that he is the first horse that Deborah has ever bred intentionally for herself. “He is everything I dreamed he would be and more.” Elliott is International dressage quality. When Deborah mentioned sending him to Europe, in conversation with an “O” judge, she was told that is is the kind of horse needed in the US and to please keep him here.